Especially in industrial cases of damage there are often high amounts of damage claims at stake. Some of these cases require to initially carrying out a diligent documentation and analysis of the damage circumstances. 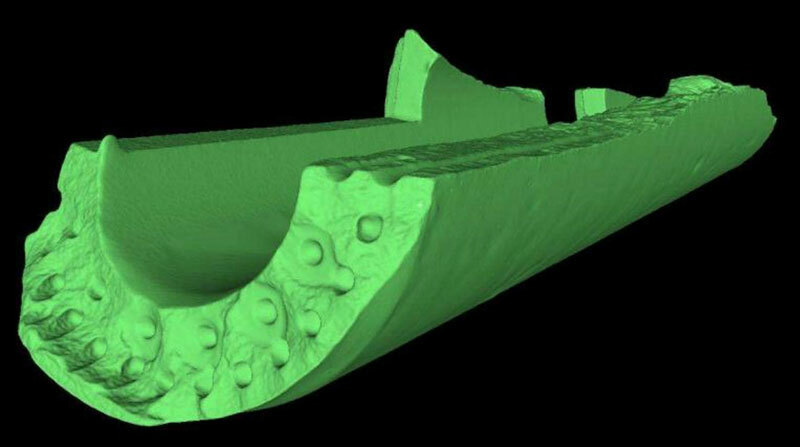 In addition to a variety of different technologies and sensors for non-destructive material examination in the field of materials science, 3D documentation techniques play an increasingly important role in this context. Thus even very large objects with their geometric data can be recorded reliably and with high accuracy. 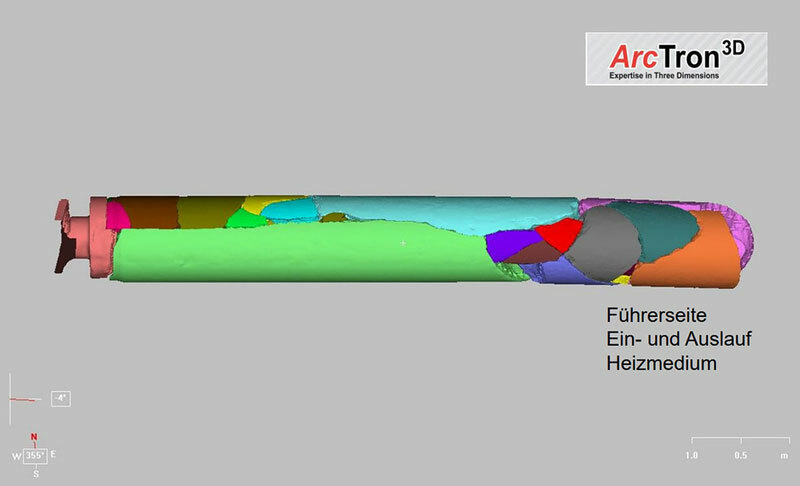 Respective surveying methods were used by ArcTron 3D in the context of proceedings for the preservation of evidence procedures. The Allinaz Zentrum fuer Technik (AZT). rates ArcTrons 3D laser scanning surveying data “as a very useful tool in damage investigation”. The task of this project was to three dimensionally record and reconstruct a burst calender roller used in the paper industry. 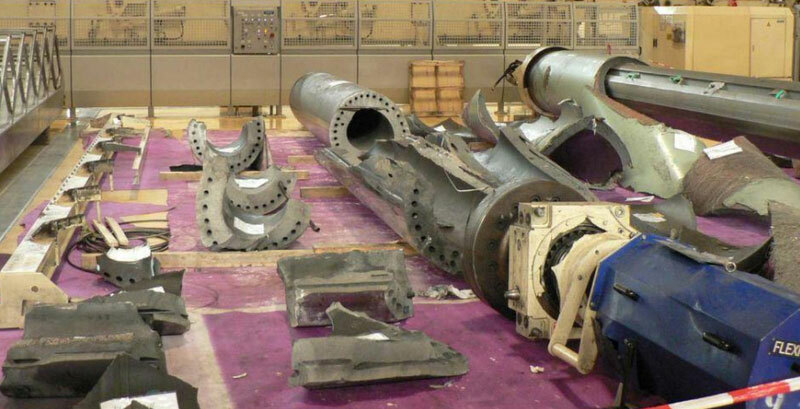 Chinese damage experts had suspected material defects. After an initial documentation and appraisal of the approximately 40 fragments, the survey was carried out using a terrestrial 3D laser scanner with an accuracy requirement in the small mm range. After the 3D modeling process of the individual fragments, the complex and time-consuming puzzle assembly was carried out on the computer. Individual fragments were spatially positioned with high accuracy. The data of this 3D puzzle was used by material scientists for the further reconstruction of the claim. 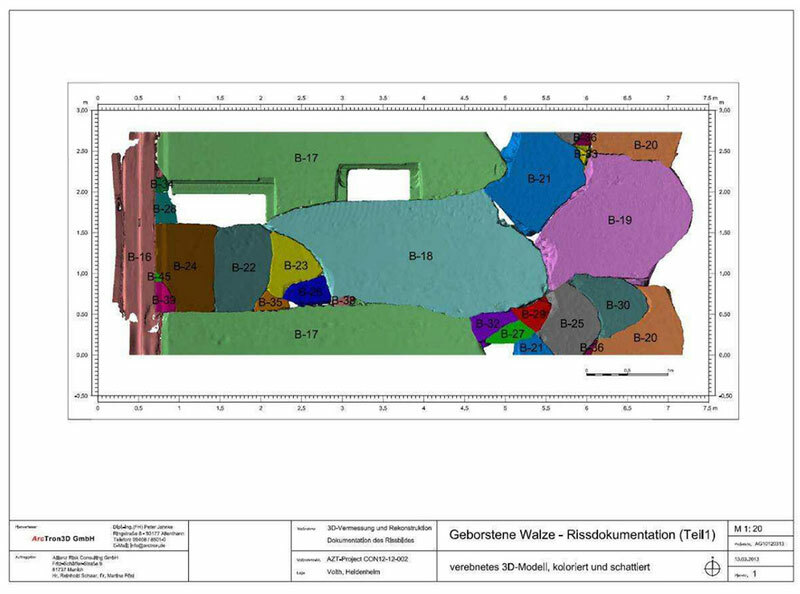 In the project workflow we used the in-house software aspect3D for the composition of the 3D model as well as for documenting the crack of the fragments. This enabled to unfurl the 3D puzzle in a leveled 2D view. The summary of all non-destructive tests, incl. additionally carried out examinations, concluded an “improper and not easily recognizable modification by the plant operator to enable a faster roller change” as a probable cause of the bursting of the roller. 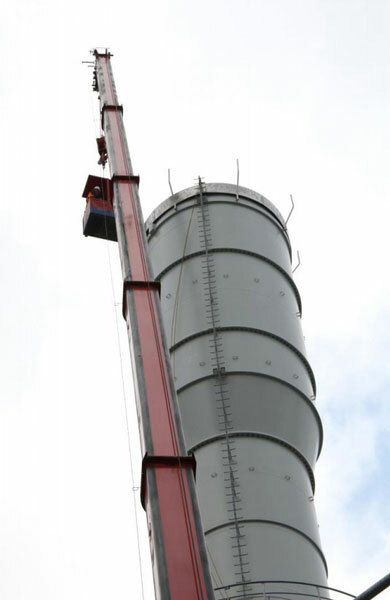 After the construction of the smokestack had been completed, significantly strong vibrations were observed. Tests like vibration measurements, flow examination, simulations, etc. initially did not disclose any plausible cause. A visual inspection of the inside of the chimney however revealed deformations of the inner tube. Our client, the Allianz Center for Technology, requested an in-situ proof of the geometric conditions with a resolution of <5mm from the exterior walls and a very high <1mm accuracy in the smokestacks inside walls. In order to guarantee these accuracies of the 3D laser scans, we combined high-quality 3D laser scanning technologies. The equipment was attached to provisionally welded platforms on the inside of the smokestacks. Avoided very steep angle measurements, the engineers carried out the laser scan survey of the entire interior surface. On the basis of ArcTron’s high-precision documentation results, it was possible to carry out a comparison with a relevant tolerance guideline. The particular focus was on the indentation of the inner tube, the out-of-roundness and center deviations at the lower part, the cone and top part of the smoke-stack.